Talk about a light, filling, healthy recipe! 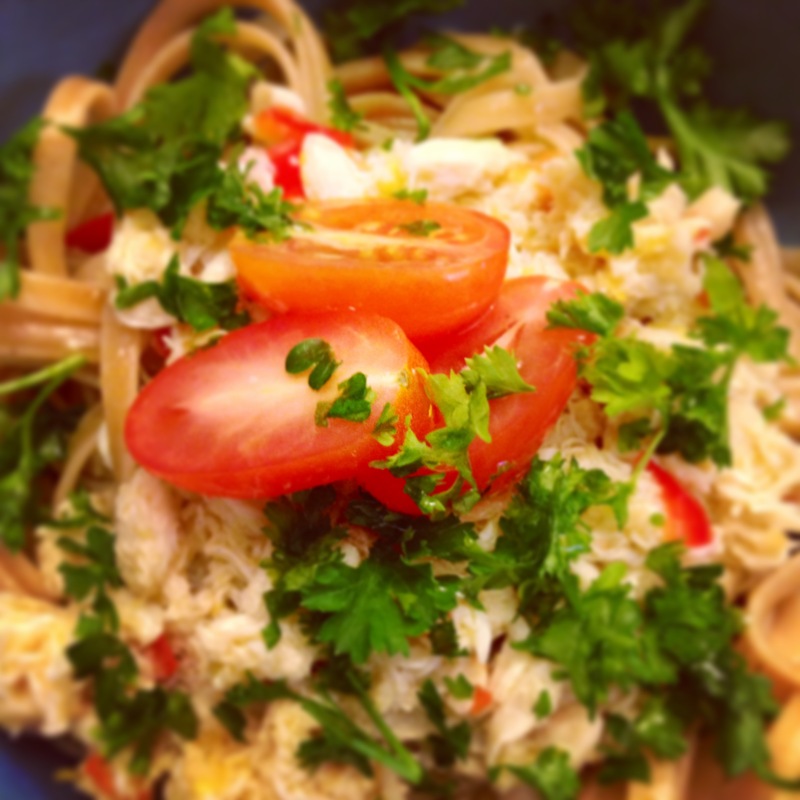 This linguine takes my love of crab to another level! It has such a freshness about it with the lemon and the cherry tomatoes, makes my mouth water just thinking about it! The best thing about this recipe is that it took me just about 15 minutes to make from start to finish! Boil water for your pasta. Make sure to season it with salt and add olive oil if you are using whole wheat linguine. Add in the pasta and cook according to the package. In a small bowl, cut the tomatoes and sprinkle them with a little sea salt. In a mortar and pestle, crush the garlic and chile into a red pulp. (If necessary, add a little sea salt to help grind the two together). Mix in the olive oil, lemon juice, and lemon zest. Add the crab to the mix if your mortar and pestle is big enough; if not, transfer everything to a slightly bigger bowl. Once the pasta is cooked, drain, and pour the crab mixture on top of your pasta. Add the tomatoes and sprinkle with parsley. By far the easiest, most delicious chicken I’ve ever had! It combines a bit of greek flavors with the herbs and feta cheese, but you can’t get any tastier and healthy than this recipe. If you don’t like feta cheese I am sure you can substitute for goat cheese. Preheat oven to 375°F. Mix all the stuffing ingredients in a bowl. Spoon the mix onto each Chicken Breast. Roll the chicken around the stuffing and place in a small baking pan brushed with oil. Bake for 35 minutes. With the leftover mixture, put it in the food processor with about 1/4 cup of olive oil and 1 tsp of salt. Blend until smooth (it should look like a pesto). To prepare the sauce: combine the tomato sauce and jalapeño in a pot over medium heat. Simmer until warmed through. If you don’t want to add the jalapeño, you can simply just used a jarred tomato sauce of your choice. 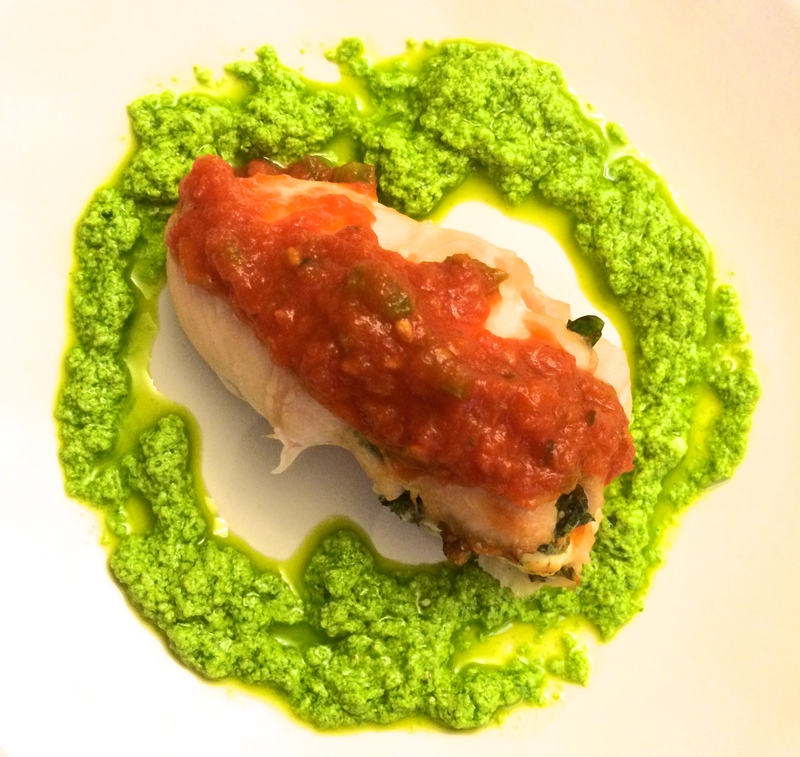 To plate: circle the “pesto” around your plate, place your chicken in the center and spoon the sauce on top of the chicken. This recipe takes my love for brussels sprouts to a whole new level! This healthy side-dish/salad is by far the tastiest! I even ate the leftovers cold the next day and it was just as good. You can adjust the ingredients based on what you have on hand or add more of the ingredients you prefer most. As you can tell I used a lot of cabbage and brussels sprouts, and less of the almonds. Heat 2 tablespoons of the oil in a pan oven medium-high heat. Add the Brussels sprouts. Cook the sprouts for about 10 minutes, stirring occasionally, until they start to brown. While the sprouts are cooking, heat up the remaining 1 tablespoon of oil in a small pan over medium heat. Add the shallots. Sautee for 3-4 minutes until clear and then add in the almonds and garlic. Cook for another 3-5 minutes until everything starts to brown, but be very careful not to burn the almonds or garlic. Remove from the heat. 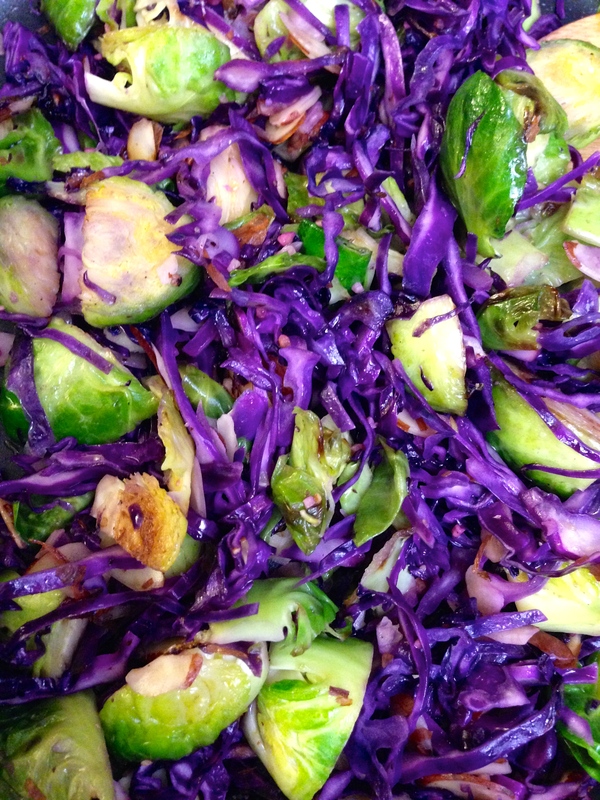 Once the sprouts have started to brown, add the red cabbage and continue to sauté until the cabbage is tender. Turn off the heat and add the toasted almonds and shallots. Give it a good toss and then season with salt and pepper. Serve warm. I am always looking for a new fish recipe. I saw this recipe on The Chew and knew I had to try it. It has that spicey factor that my husband likes so I thought it would be a good new recipe to try. Needless to say this is a definitely a recipe to keep in mind! Mix together all of the ingredients except the Salmon. 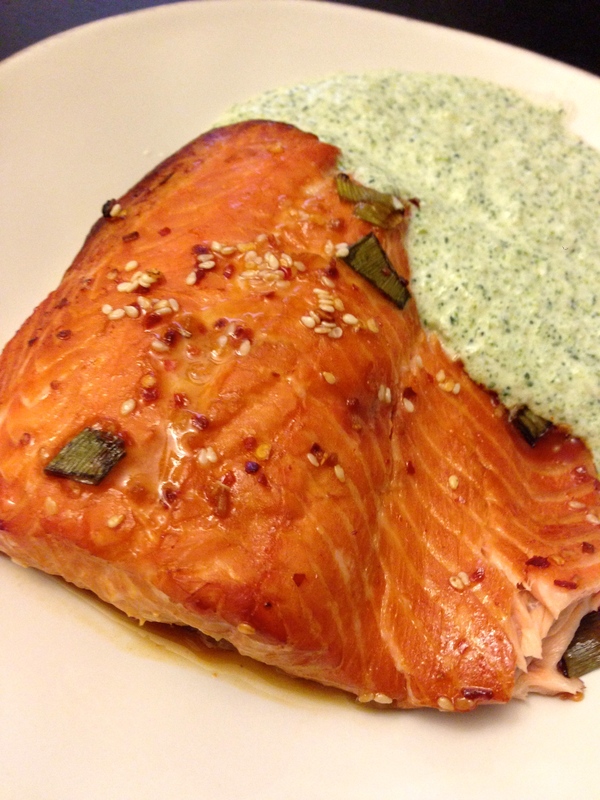 Place the Salmon in the marinade and cover in the fridge for 2 hours. Remove Salmon from the fridge while oven is preheating. Preheat Oven to 450°F. Lightly grease a baking sheet with non-stick spray. Transfer Salmon to a baking sheet and bake for 15 minutes or until desired doneness has been achieved. There is so much you can do with chicken. This recipe is a great, fresh, clean chicken recipe that I will definitely make over and over again. Preheat large cast iron pan or non-skillet over medium-high. Season chicken liberally with salt and pepper on both sides. Brush one side of the chicken breasts with dijon mustard. Dredge the chicken with hazelnuts. Drizzle the pan with a tablespoon of olive oil. Cook for 2 to 3 minutes then flip and continue cooking for 2 more minutes or until golden and cooked through. Remove from pan and cook remaining chicken. Set cooked chicken on a plate and tent with foil until ready to serve. In a large bowl, combine the remaining ingredients and toss to coat. Season with salt and pepper. 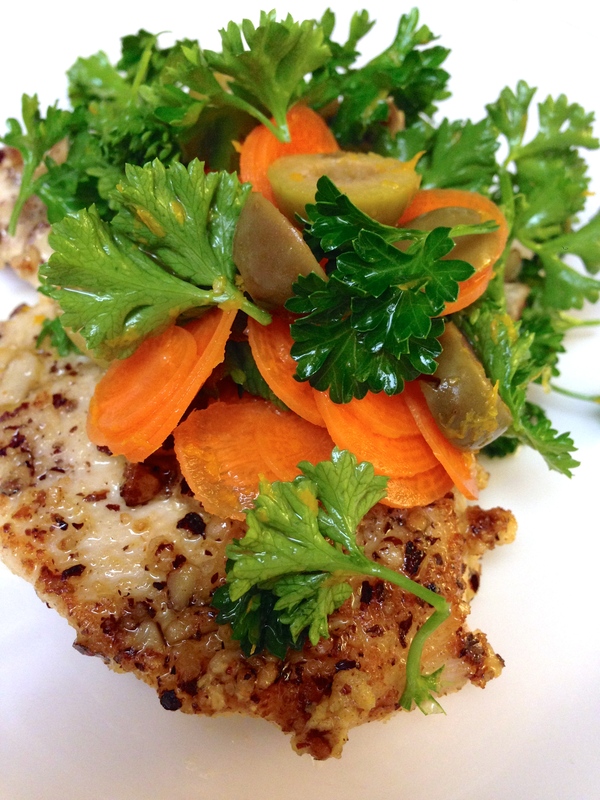 Serve warm chicken topped with carrot slaw. Tip: Coating the chicken with crushed hazelnuts is a great alternative to breading, and is also gluten free. I originally found this Giada recipe a couple years ago. It has been my go-to comfort recipe for just as long. Her recipe originally called for this sauce to be spooned over a baked potato which is so good! But lately, I haven’t had the time to bake potatoes so this time I took her recipe and spooned it over pasta. What I love most about this sauce is that it is so good over anything! 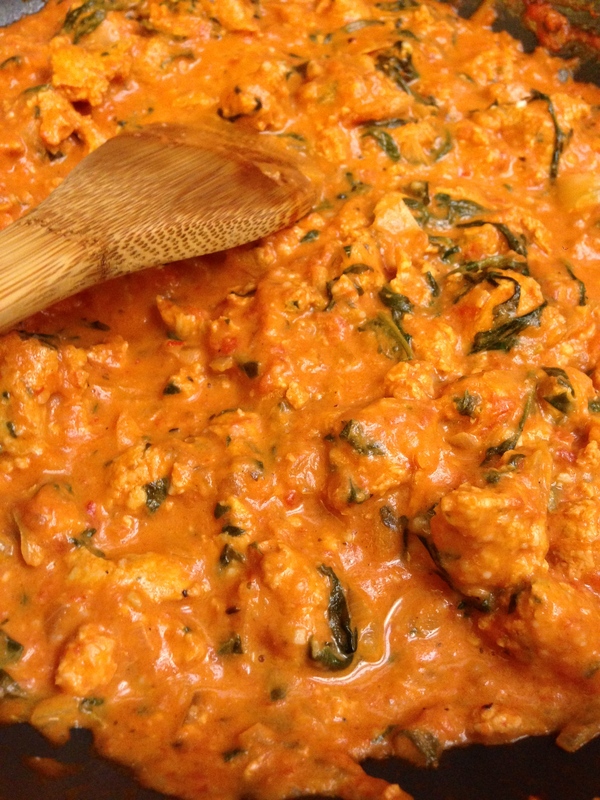 Another great thing about this sauce is that you can use whatever kind of sausage you want. Her recipe originally called for italian turkey sausage, but as you know my husband is a big fan of spicy. I found a great sriracha chicken sausage from the Whole Foods by us and it was the perfect choice! So feel free to use whatever type of sausage you and your family prefer! In a large skillet, heat the olive oil over medium-high heat. Add the onions, 1 teaspoon salt and 1/2 teaspoon pepper. Cook, stirring frequently, until softened, about 3 minutes. Add the garlic and cook until aromatic, about 30 seconds. Add the sausage and break up the meat into 1/2-inch pieces with a wooden spoon. Cook until browned and cooked through, 6 to 8 minutes. Add the marinara sauce and arugula. Bring the mixture to a boil and cook until the arugula has wilted, about 2 minutes. Add the mascarpone cheese and stir until the mixture forms a creamy sauce. Remove from the heat and stir in the Parmesan. Season with salt and pepper. I LOVE brussels sprouts! This salad just became my most favorite salad ever. It is so easy to prepare and is a different twist on a plain green salad. I am pretty sure I turned my husband on to the beauty of brussels sprouts after this salad. Dressing: In a small bowl, whisk together the olive oil and lemon juice until combined. Season with salt and pepper, to taste. Salad: Using a small paring knife, remove the outer leaves from the Brussels sprouts. (See tips for another use for the cores). Bring a large pot of water to a boil over medium-high heat. Add the Brussels sprout leaves and cook for 1 minute. Drain and put in a bowl of iced water, then transfer to a colander to drain. 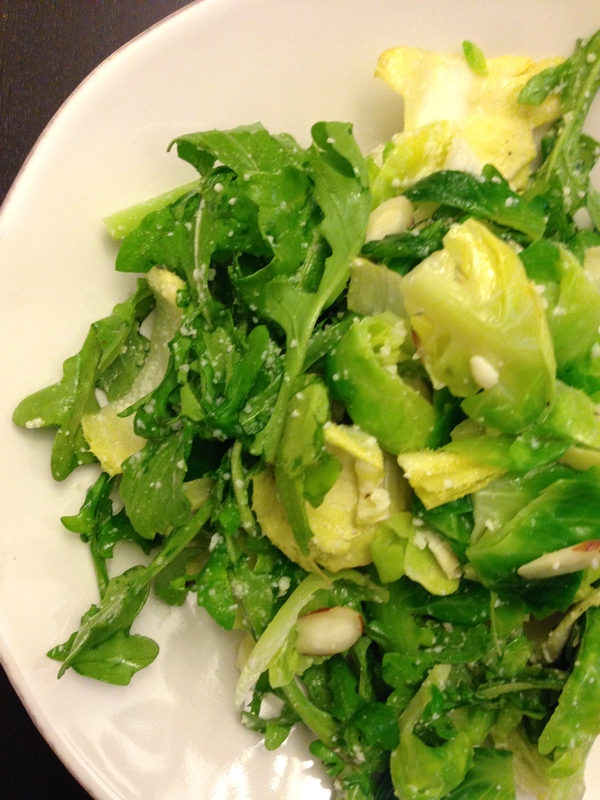 Put the Brussels sprout leaves, arugula, endive, and almonds into a large salad bowl. Add the dressing and toss together. Sprinkle with the cheese and serve. *To toast the almonds, arrange them in a single layer on a baking sheet. Bake in a preheated 350 degree F oven until lightly toasted, about 6 to 8 minutes. Cool completely before using. *The unused core of the Brussels sprouts can be used in soups and stir-fries. I saw this recipe on The Chew and knew I had to try it. It was featured on an episode of people competing for the Weight Watchers challenge so you know it’s healthy! This recipe consists of a simple marinade, quick oven time, and a yummy sauce. The recipe originally called for a sear before roasting but I wanted to cut the cook time so I just roasted it in the oven without the sear and it was just as good! Keep note, if you don’t have fresh herbs on hand, it’s totally fine to use dried. This pork tenderloin is a must-try for a healthy meal! In a large zippered plastic bag, mix the Oregano, Thyme, Zest, Garlic and Olive Oil. Place the Pork Tenderloins inside the bag, coating them evenly. Then store in refrigerator anywhere from 2 to 24 hours (I stored mine overnight). Place the refrigerated Pork Tenderloins into a pre-heated, 400 degree oven for 20-23 minutes, or until internal temperature reaches 140 degrees. In the meantime, make the mint yogurt. Mix the Yogurt, Mint, Dill, Lemon Juice, Salt, and Pepper in a bowl, and vuala! When the pork is done cooking, transfer it to a cutting board to rest for 5 minutes (to seal in all the juices). Slice into ¾” oval pieces. Allow 3-4 pieces per serving. 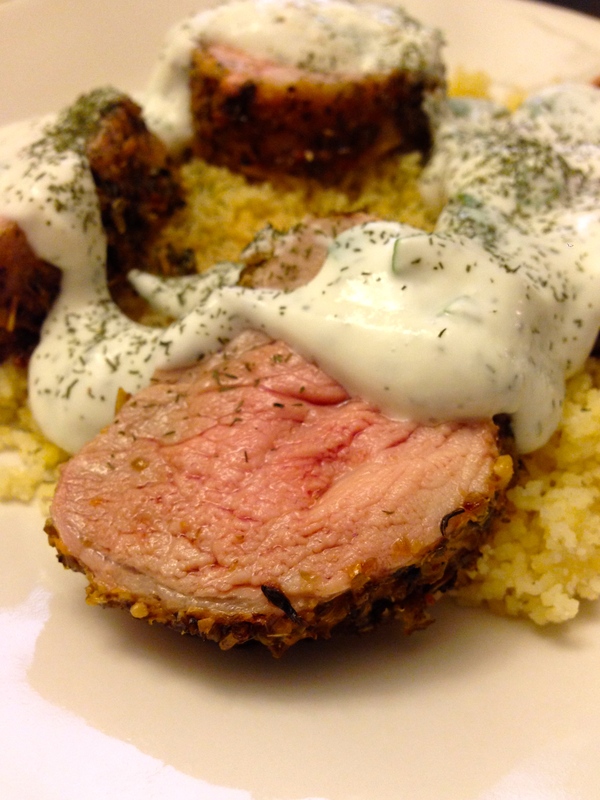 As usual, I served this over couscous but feel free to serve over quinoa, rice, or tabbouleh.